Are blog comments the key metric of success? The short answer is “no,” although most bloggers are lying if they say they don’t want more comments. Blogging is a content marketing cornerstone, and comments are not necessarily the only indication of success. 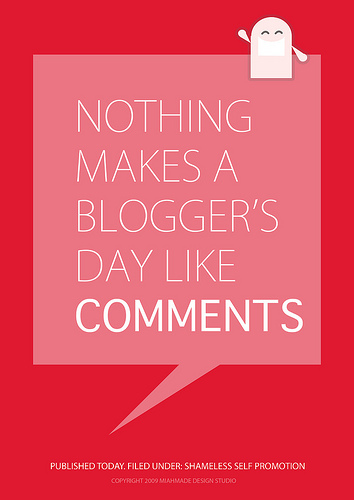 If a blogger thinks that comments are the only measure of success, a lack of comments on a blog can kill it. The assumption is that no one is reading a blog without comments. How wrong! Some blogs skip comments altogether. This practice is criticized for turning your blog into a soapbox, a one-directional conversation. But supporters say that by opening your blog to comments, you may start to soften what you say or try to appease any naysayers and “trolls” who appear. Everyone has a right to their opinion, but they do not have a right to express it on your site. A blog is not a democracy, and those that try to be are usually less engaging for it. Comments are not everything. A lack of comments does not automatically indicate a lack of readership. Nor does a lack of commenting accurately reflect the search strength or branding prowess a blog can provide. The theory of the Long Tail is that our culture and economy is increasingly shifting away from a focus on a relatively small number of ‘hits’ (mainstream products and markets) at the head of the demand curve and toward a huge number of niches in the tail. There’s so much traffic in the tail it is hard to even comprehend. To illustrate, if search were represented by a tiny lizard with a one-inch head, the tail of that lizard would stretch for 221 miles. 4. A weekly updated blog can increase sales leads by 68% or more, reports HubSpot. The “or more” percentage comes once there is a backlog of at least 20 quality, original posts. 5. Blog content can be “upcycled“ and reused and formatted into different media channels. This makes the effort spent building blog content more valuable to a business in the aggregate. 6. Blogs without many comments can provide other intangibles important to business, too. These include but are not limited to: demonstrating and disseminating knowledge, sharing company information (externally as well as internally), and presenting a more equitable publishing platform to bring good ideas to the surface. So, don’t believe that a lack of comments means your blog is not valuable. It is. Learn more about Newsblogging, our method for professional, corporate blogging — sometimes posts get comments and sometimes they don’t — but, regardless, the blogs we manage are working for our clients. Image by miss miah, used under its Creative Commons license.